The Isle of Skye is home to one distillery, Talisker at Carbost overlooking Loch Harport. The whisky has a full peppery, sweet flavour with explosive intensity and a good dose of warming peat-smoke - a great dram on a cold day. TCP, tarred boat, iodine-impregnated seaweeds. Peat. Wouahh! Then candied orange, trifle, milk chocolate. And the beat goes on… iodine, tar pastilles, salty water. Ginger bread. Liquorice. Warm, salty. Dry and nutty. Sooty touch. Loch Harport on a winter's day, gale force eight! Less peppery than younger versions. Complex, endearing, balanced. 18 seems a perfect age for malts. Complex, burning heather, sweet tobacco, old warehouse, spent bonfire. Underneath is almond paste/nougat, butter biscuits and a lightly herbal note. Plenty of smoke. Rich and complex. A slow start, then pepper, a light smoked fish note, fruit syrup. Builds to an explosive finish. Truly fantastic. 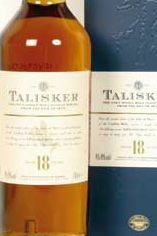 All of Talisker's attack...and then some.